Spreads return - now on all instruments! We are glad to inform you that we have improved the popular promotion on spread rebate (previously named "Spreads in half"). Take part and obtain even more profit from cooperation with "FreshForex" ! 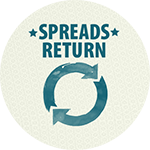 Under “Spreads return” promotion, you can rely on the profit no matter how you closed a trade and which contracts you choose. Now rebate is also paid on such popular instruments as CFD on energies, stock and indexes. Just choose your rebate option and trade without limits! Please pay attention that each week you can change rebate scheme in the Personal area. The rebate is settled in the end of each week and is available both for trading and withdrawal. You can find detailed terms on the promotion page. Be on time to take part! Be on time to double your deposit prior to NPF release!